Payments by Postal Orders or Cheques drawn on UK banks accepted. Payments by Bank Transfer and EU Bank Transfer accepted. Please note: Cheque clearance may take between 5 and 8 days. 2 Body Lift Kit - Range Rover P38. The original and best body lift kit from Xpajun Off-Road. This is a high quality UHMW kit NOT inferior Nylon or Delrin. The kit has minimum 60mm diameter spacers to avoid'punch-through' of your body mounts. 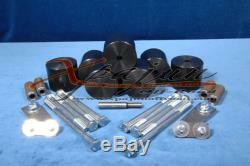 This kit will raise your truck's body by a nominal 2 (50mm). Raising your body will enable you to fit bigger diameter tyres allowing you more clearance under the vehicle. The 2 kit is the easiest of our kits to fit, no alteration of the radiator or it's associated componants are required with this kit - further instructions can be found Here. And you'll find some P38 FAQs Here. BT, GG, JE, IM, IV, HS, KA27-28, KW, PA20-49, PA60-78, PH17-26, PH30-44, PH49-50, PO30-41, TR21-23, ZE. Why Xpajun Off-Road are the best. Body lift kits made by Xpajun Off-Road are designed and manufactured by our engineers, qualified in the synthetic industry, to exacting tolerances, before being tested in extreme conditions on our own vehicles. They are high quality kits at a price that is affordable (because we're 4x4ers as well). We are the leaders not the followers, we design and test the modifications that others try to copy. We make and supply quality parts and check them all before they are sent out, you'll find no off centred holes and no rough cut spacers. We do not use Acetal Resin (Delrin) in the production of our kits. Acetal Resin is not suitable for lift block spacers due to the following reasons. Sensitive to acid hydrolysis and chlorine attack. Subject to stress corrosion cracking. Most importantly we listen to what you, the customer, has to say and act on it. _gsrx_vers_525 GS 6.6.5 (525). Add a map to your own listings. The item "2 Body Lift Kit Range Rover P38" is in sale since Tuesday, October 01, 2013. This item is in the category "Vehicle Parts & Accessories\Car Accessories\Other Car Accessories". The seller is "xpajun" and is located in Dartmouth. This item can be shipped worldwide.